Loops of tubular webbing or cord, called runners, are among the simplest pieces of climbing equipment and among the most useful. You'll use them in endless ways as a critical link in climbing systems that involve you, your rope, safety anchors and carabiners. Fig. 6-34. 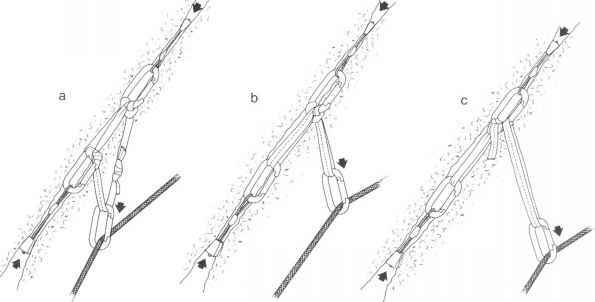 Runners made of webbing: a, tied runner; b, sewn runner. Runners are most commonly made by tying a loop with 9/16-inch to 1-inch webbing or with 8-millimeter to 9-millimeter perlon accessory cord. With webbing, a water knot is typically used to make the loop; with cord, a double fisherman's knot does the job. Melt the ends of your runners with a match or candle to keep the nylon from unraveling. Most standard runners are made from about 51/2 feet of webbing. You will also need several double-length runners, which take 9!/2 feet of material. To help you quickly identify the different lengths, make standard runners from one color of webbing and double-length runners from another color. You should also write your initials and the "manufacturing" date on the tails of all your runners so that you know which are yours and when to retire them. Tied runners (fig. 6-34a) have several advantages over commercially made sewn runners. They are inexpensive to make, can be untied and threaded around trees and natural chockstones, or can be untied and tied to another length of webbing to create extra-long runners. However, sewn runners (fig. 6-34b) also have some advantages. Sewn runners, always made of webbing, are stronger, lighter, and less bulky than knotted runners. They also eliminate the possibility of the knot untying, a continual concern with homemade runners. Sewn runners come in four normal lengths: 2-inch and 4-inch "quick draws," 12-inch "half-lengths," and 24-inch "full-lengths." They also come in a variety of widths, with 9/ 16-inch, 11 /16-inch, and 1-inch being most common. Runners made from Spectra—a high-performance fiber that is stronger, more durable, and less susceptible to ultraviolet deterioration—are usually made from 9/ 16-inch webbing.